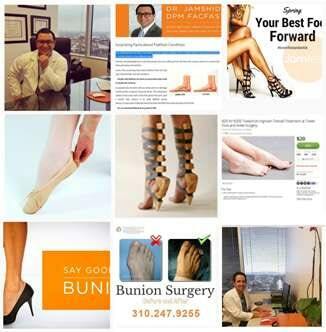 Diabetic Foot Treatment Los Angeles | Diabetic Foot Specialist L.A.
Diabetes impacts the lives of over 25 million people in the United States. Over 7 million of these people don’t even know they have the disease yet. Additionally, nearly 80 million people in the US are considered to have “prediabetes” which may progress to diabetes. The disease is characterized by the body’s inability to make or properly use insulin. This impairs the body´s ability to convert sugars, starches, and other foods into energy. This causes extremely elevated sugar levels in the blood to accumulate. The long-term effects of elevated blood sugar (hyperglycemia) include damage to the eyes, heart, feet, kidneys, nerves, and blood vessels. If you have diabetes you should keep a close eye on all of the areas of the body that diabetes effects including: the cardiovascular system, the renal system (kidneys), the eyes, and the feet. 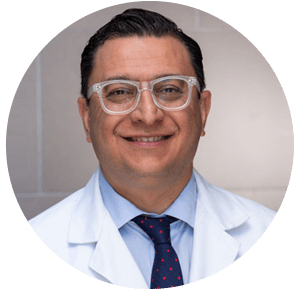 Bi-annual checkups with your primary care doctor and podiatrist in Los Angeles are the key to avoid severe complications that can be caused by diabetes. Foot care is especially important for people with diabetes, because they are prone to poor blood circulation and nerve disease in the extremities. A common complication of diabetes is peripheral neuropathy, which is the loss of feeling in the feet and toes. If you can’t feel your feet and you get a cut in an area that isn’t clearly visible without thorough inspection, it can get infected. When you have diabetes, it makes it more difficult for your body to fight off infections in your feet. Patients can get sharp objects lodged into their feet without feeling them, resulting in infection which may require amputation to prevent involvement of the entire leg and/or body. A loss of feeling in your feet. Foot ulcers or sores that do not heal. Dry Cracks in the Skin. Ingrown Nails or Fungal Nails. Although amputation is not always required, over 65,000 amputations are performed each year due to complications from diabetes, making it a very real complication. By regularly visiting a podiatrist in your diabetes care you can reduce the risk of lower limb amputation by up to 85%. 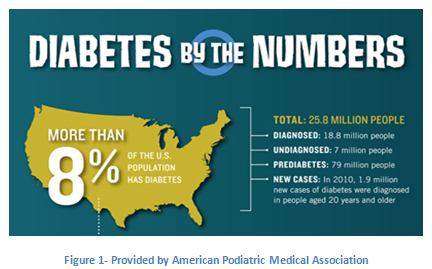 Podiatrists are an important part of providing appropriate care for people with diabetes. Most podiatrists recommend annual examinations at a minimum, although for patients at higher risk, more frequent screenings may be necessary. Diabetics with no risk -> yearly foot examinations are fine. Diabetics with new acute symptoms or problems -> should be seen immediately. Patients with diabetes that have lost sensation in their feet due to peripheral neuropathy and no longer feel pain in their feet are at the greatest risk for experiencing severe complications. These patients must be extremely cautious and inspect their feet everyday with the help of a family member or caretaker if they are unable to do so themselves to look for any areas of injury, irritation, cuts or sores. 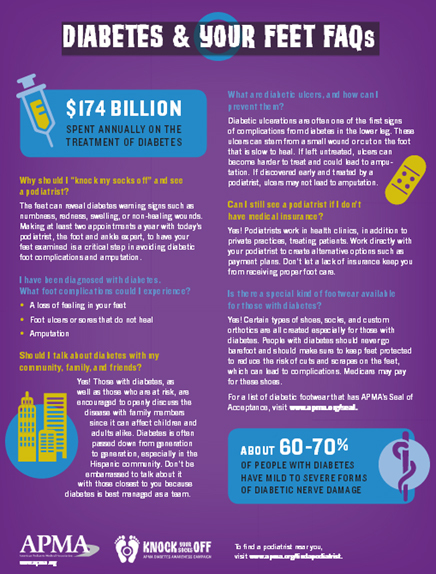 The American Podiatric Medical Association has put together a very informative graphic discussing the most commonly asked questions that patients with diabetes ask their podiatrists. Visit the American Podiatric Medical Association’s website to learn more about the “Knock Your Socks Off” Diabetes Awareness Campaign.